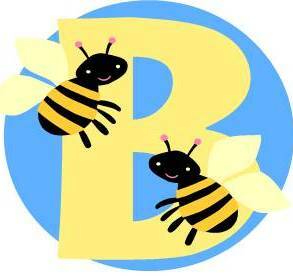 Momma Bee went to her first couponing class last night. What did I learn? 1. I found out that there is so much I still need to learn. 2. I learned that there are lots of really nice people who, like me, are trying to stretch their budgets and save money as they shop for their families. 3. I learned more about the fanatical, extremers who are cheating and making honest money saving harder to do. I've been reading and seeng lots of information about how people are saving a lot of money on essential items as they shop at CVS. My oldest daughter tutored me in my first really serious coupon and Extra Care Buck shopping trip at CVS tonight. Here are some pictures and details. 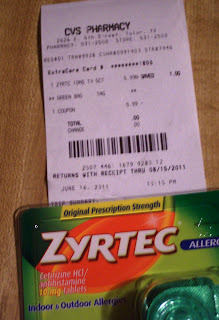 Transaction #1: I had a FREE 5 count Zyrtex coupon up to $7.99. These were $5.99 at CVS so these were FREE=$0.0, plus I got $5.99 in Extra Care Bucks. So this was a money maker. Transaction #2: Schick Hydro 3 were $8.79 less $4 coupon=$4.79; Bayer Advance were $3 less $2 coupon, and Tic Tacs were B2G1 at 2 X $1.57 less $0.75, plus $5.99 Extra Care Bucks from transaction #1. Final cost: for All $1.58 PLUS earned $1 and $4 extra care bucks. 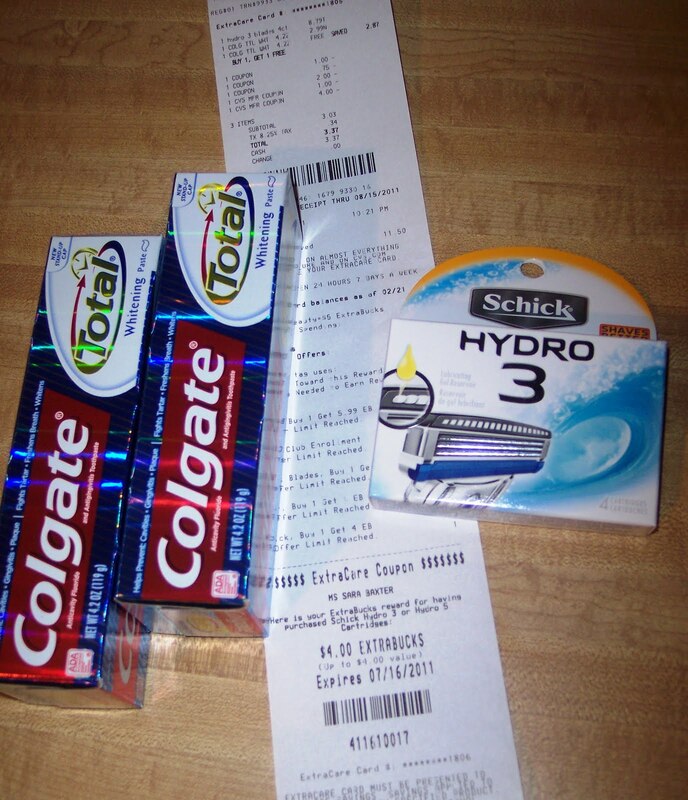 Transaction #4: Tooth paste BOGO at $2.87 less $1.00 off and $0.75 off coupons. Hydro 3 razor refills $8.79 less $2 off coupon. Plus less $1 and $4 extra care bucks. 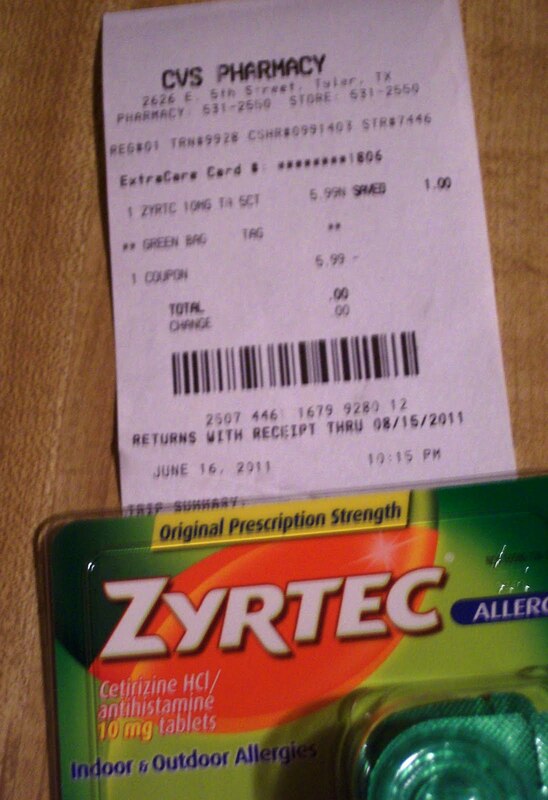 Final cost: $3.37 plus earned $4 more extra care bucks! 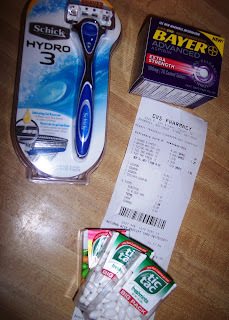 Total shopping trip: $36.23 less coupons and Extra Care Bucks = Out of Pocket spent ===>$4.95 plus I have $4 in Extra Care Bucks to use on my next visit to CVS! PLUS, I also got a print out with a $4 off $20offer when I go online and update my email address on CVS account. Will get the coupon in the mail in about 3 weeks. I LIKE IT!